A recent screening of I Like Killing Flies inspired this recipe. The film documents the eccentric antics of Kenny Shopsins, chef and owner of the (formerly) Greenwich Village-based diner, Shopsins. Despite his notoriously profane behavior towards customers and his "no-party-over-five" rule, his restaurant boasts an inclusive menu that puts Encyclopedia Britannica to shame, and never stops growing. A brief soup montage in the film rattles off a few of (the 86) brothy favorites, and the cilantro & quinoa combo particularly caught my attention. No idea what else was in Shopsins' recipe, but taking the title ingredients at face value, I rolled with it. Mostly I was intrigued by the idea of elevating an herb from its role as garnish to star of a dish. Of course quinoa is there to bulk up the broth, but I wanted to make the presence of cilantro more than just background noise, so I went pretty gung-ho with it. The supporting cast is simple -- red onion, garlic, coriander, salt/pepper, and a pinch of cayenne -- but the soup has a surprising amount of personality. Here it's topped off with a summery trio: grilled shrimp, diced avocado, and charred corn-off-the-cob, (and, of course, more fresh cilantro). 1. Heat olive oil in a medium pot over medium-high. Add garlic and cook for a minute, stirring constantly. Add sliced red onion and cook until softened, about 3 to 5 minutes. 2. Rinse 1 cup quinoa and add it to the pot with the onions and garlic. Stir to coat and cook for a minute or two, until quinoa becomes fragrant and toasted. Add 4 cups vegetable stock and cilantro and bring to a boil. Reduce heat and simmer for 15 minutes until quinoa is cooked. (Add more stock or water if the soup is too thick). Season with salt, freshly cracked black pepper, ground coriander, and a pinch of cayenne. Squeeze in juice from 1/2 lime. Taste, and adjust seasoning as necessary. 3. Serve warm, topped with grilled shrimp, diced avocado, corn-off-the-cob (grilled or fresh), and more fresh cilantro and black pepper. 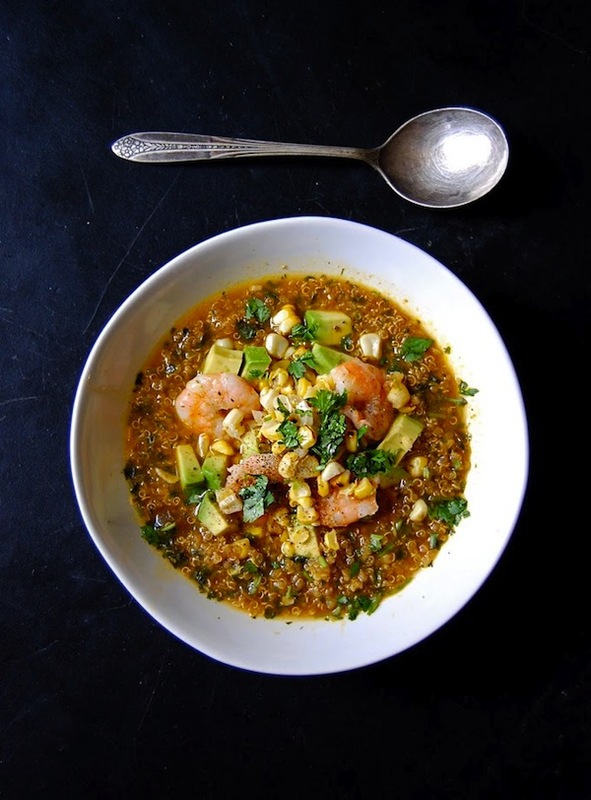 Ok, I honestly didn't know what to think when I saw "cilantro soup"--an all-green tangy herb puree with a dainty scoop of quinoa on top?--but the combination with shrimp and corn sounds amazing! This is a fantastic, It is glad to see this blog, nice informative blog, Thanks for share this. Wow! This looks amazing... I can't wait to give it a try! The recipe doesn't indicate when to add the 1 cup of cilantro. I made some assumptions and added the cilantro right before the vegetable broth is added, but have no idea. No matter, it turned out amazing! How many does this serve? Thanks! Wow, I just made this, and for such a simple recipe it really packs a punch! Absolutely delicious!! Made this for dinner last night and it was enjoyed by my entire family... this means my husband, my 1 year old daughter, and 3 year old son all loved it! This doesn't happen often. :) Thanks for sharing!! Aw such a sweet comment, glad to hear it! Hi - I want to try. But am confused -- when do I add in the cilantro that is not the garnish? Add it with the stock! Yeah, sorry , that's confusing, I'll fix. recipe looks great, can it be made in a slow cooker? How? Love the sound of this! Sounds seriously delicious! I have made this a few times and love the complexity of flavors. Thank you for a wonderful recipe. Just made this and it was delicious! Totally reminds me of a soup I ate in Ecuador. I topped mine with spicy pan-seared shrimp and fresh corn. Thanks!